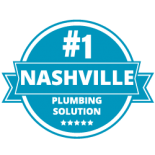 At Plumbing Solutions, our number one goal is to provide our customers with the best, most reliable and affordable plumbing services to Nashville and surrounding communities. 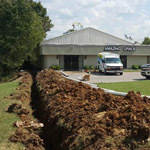 We truly go above and beyond for each and every person who trusts us with their plumbing system, and we know we have some of the most experienced plumbing technicians in the area. 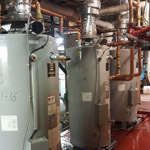 In today’s blog post, we wanted to share some of the reviews you can find online about our efficient and effective plumbing services. Continue reading below for just three of many great reviews about our local plumbing company! Contact us today to get a free plumbing quote. “The dread of having our plumbing fixed is finally over thanks to these guys. When I called, I was a little surprised that I could get an estimate so quickly, but it was a relief to be able to work around my schedule. He gave us a price before he left on Friday and they got to work that following Monday … Thank you so much. My mind is at ease and we can finally do dishes again. I’m certain we will need more work in this old house of ours. I will be using Plumbing Solutions from now on.” — Pascale K.
We’re so happy you no longer dread plumbing services thanks to our experienced team! 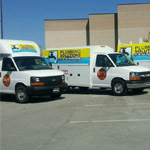 We make it our mission to provide customers with a plumbing experience unlike anything else. Thanks for the wonderful review, Pascale! We appreciate you. “I would highly recommend this company! My call was answered quickly and 2 plumbers were at my house within 2 hours. I was very glad to hear there was a $49 option for snaking the drain, as opposed to $300+ it would take to remove/rotate the toilet. 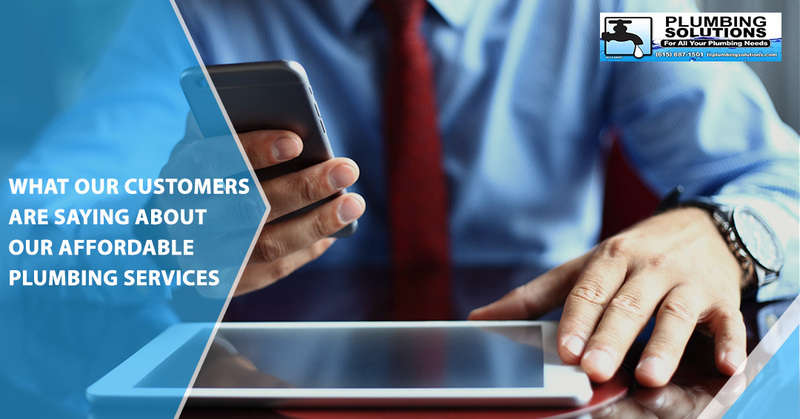 I had a high-quality experience with this company and their employees and would use them again.” — Allison S.
Of course, when you choose Plumbing Solutions, you know you’ll get affordable plumbing services — but just how quickly will you get them? According to Allison S., you’ll get them super fast! We look forward to working with you again soon! “These guys were the only ones out of all the people we requested quotes from to respond. I’m happy they did. They were fast, efficient and courteous. They had the job done in 10 min and it was done well and with quality products. 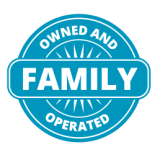 I would recommend them for your plumbing needs.” — Alfred C.
We take pride in our ability to quickly respond to local customers with detailed and accurate quotes. Thanks for the great review and for future recommendations, Alfred! Do you want to leave a review about our plumbing services? We appreciate all honest and open feedback, and we truly want to hear your opinion about how we did! Leave a review for our plumbing company here. 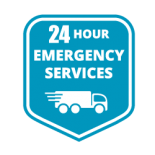 Whether you’re in a plumbing emergency or simply need a new water heater installed in your home, we’re the team for the job. 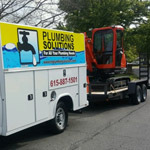 Contact Plumbing Solutions today for any of your plumbing needs. You can reach us by calling (615) 823-7223 or by filling out our form online.